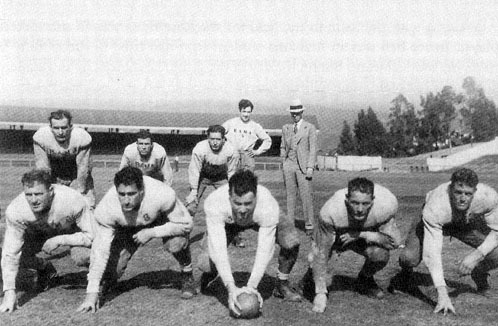 The 1930 Alabama team prepares for the Rose Bowl in California. As the 1930 football season began, Alabama was a program in transition. Between 1927 and 1930, The Crimson Tide had produced no better than a 6-3 record and hopes that Alabama football could rebound for a Southern Conference title - much less a Rose Bowl berth and a chance at a National Championship were - were small. They got even smaller in April 1930 when head coach Wallace Wade announced he would resign at the end of the season to take the head coach position at Duke the following year. Wade handpicked Georgia assistant Frank Thomas as his successor and brought him on board his staff to ease the transition after the season. At the onset, the peculiar situation left little reason to expect better than the mediocre seasons that had gone before. But Wade believed he had a special group of players on his hands for the 1930 campaign and he made it clear to them what his goal was in preseason practices. "Gentlemen," he told them. "I’m gonna win this damn championship this season and if you want to be part of it, let's get going. If there is anyone here who is not 100 percent committed, leave now." As the season started, it became apparent his players had taken heed. Alabama began destroying opposing teams. "The thin red line is a think of the past, existing no more," opined sportswriter Everett Stupper in the Atlanta Journal Constitution after the game against Ole Miss. "The red elephants have replaced it at the Capstone." Wade’s squad was so strong defensively that he began starting the second team for the first quarter and putting the starters in after the second period had begun. The practice tended to demoralize opponents that had struggled against the "scrub" players for 15 minutes and saw the fresh starters enter the game. He used it in no less than eight games during the season. Alabama rolled up seven shutouts on their path to an undefeated regular season and the Southern Conference Championship. The Crimson Tide had outscored their opponents 247 to 13 - just two teams, Tennessee and Vanderbilt, proved able to manage a single touchdown against Wade’s stingy defense. An invitation to play in the 1931 Rose Bowl followed. The opponent would be undefeated Washington State (then State College of Washington). The Cougars were led by Coach Orin E. "Babe" Hollingbery – who had amassed a 26-9-2 record between 1926 and 1929. Like Alabama, the 1930 Washington State squad had become the Pacific Coast Conference champions with a dominating defense. The line was anchored by All-American Mel Hein and Glenn "Turk" Edwards, considered two of the greatest players to emerge from the school’s long gridiron history. Leading up to the New Year's Day game, Wade kept to his habit of rigorous practices – even on Christmas Day – and keeping his players under his watchful eye. Sightseeing was almost completely eliminated; Alabama players weren't even allowed to go see the famous Tournament of Roses parade. "We did go on one little trip," recalled the team’s All-American tackle Fred Sington. "Out to an orange grove. We picked two oranges and came back. That was his big outing." Jan. 1, 1931 proved to be a dour affair in Pasadena with the famed Southern California sunshine giving way to a drizzling rain. Still, interest in the game ran high. Tournament of Roses officials estimated 81,000 spectators were on hand at Rose Bowl stadium for the game. The increased number of spectators was due to the recent competition of the South end of the stadium - making the venue a true bowl (instead of its original horseshoe shape). And, just like in 1927, organizers brought in additional seats to accommodate the crowd. Wade stuck to his tried-and-true practice of starting the game with the second string squad. He used the opportunity to study the Washington State defense all the while wearing down their starting players. The first period ended with neither team on the scoreboard. As the second period began, Wade put in his starters but limited their ability to execute by calling for 13 straight running plays. This offensive attack was complimented by John Cain’s punting efforts. With an average distance of 46 yards, his kicks put the Cougars deep in their territory every possession. Then, with the ball on the Alabama 39 yard line, the Crimson Tide took to the air. When the ball was snapped left end Jimmy Moore dashed into the backfield and took a handoff from Cain. Moore then stopped, turned and launched the ball to John "Flash" Suther who heading down the left side of the field. Suther caught it at the Cougar’s 22-yard line and galloped into the end-zone for the score. Washington State’s next possession came to a quick and unhappy conclusion when Crimson Tide center Jess Eberdt intercepted a pass at the Cougar 47. Alabama’s Moore threw another pass this time connecting with Ben Smith who made it all the away to the one yard line. On the next play, Monk Campbell powered in for the touchdown. Alabama’s second-quarter onslaught wasn't finished. On the next possession, Campbell faked to Moore and carried the ball through the line and then rolled 43 yards for the score – the last one of the half. 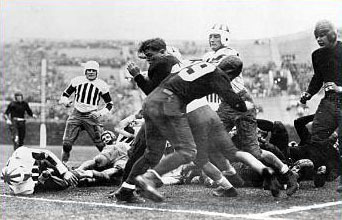 In the span of less than seven minutes, the Crimson Tide had scored a total of 21 points – an accomplishment that echoed the third quarter heroics of the Alabama team during 1926 Rose Bowl. After halftime, Wade put the second team back in the game and scoring ebbed dramatically. Still, Alabama managed a 30-yard field goal to make the score 24-0. While the Cougars defense kept Alabama out of the end zone during the third and fourth quarters, Washington State remained unable to produce points themselves. Alabama won 24-0 and gained their third National Championship under Coach Wade. It gave coach a 61-13-3 record over his eight year stay at the Capstone, including a whopping 47 shutouts - a full 61% of the games his Alabama teams played. Wade then went onto become the head coach at Duke where he would amass a record of record of 110 wins, 36 losses, and 7 ties in 16 seasons. He took the Blue Devils to two Rose Bowl games (one which he hosted in Durham, N.C. due to the bombing of Pearl Harbor the month before) but was unable to gain another victory playing in "the grandaddy of them all." His protege, Frank Thomas, took the reins of the Alabama football program beginning with the 1931 season and began a 14-year career that would rival his predecessor's in terms of achievement. A version of this article first appeared on Roll Bama Roll.